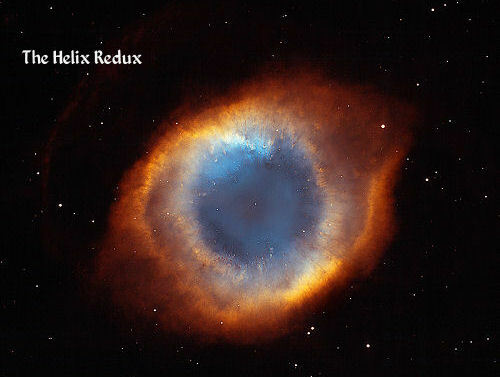 This three-dimensional model of the Helix Nebula illustrates, at left, the object as viewed in the plane of the sky, while the right image shows a cross section through the symmetry axis. 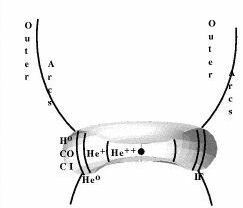 "The relative width of the neutral hydrogen zone is unknown. Although drawn as open forms, the upper and lower structures above and below the main disk may be closed bubbles, either model being consistent with the observed outer arcs." Appearance of the helix in various bands I) Left is the calibrated H image, and the right is the corresponding [O III] 5007 Å image. 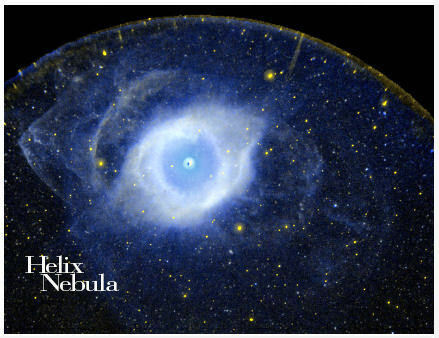 Appearance of the helix in various bands II) The image on left is the 4697 filter image, which isolates the He II line at 4686 Å with the right image being 5007 Å divided by H emission. 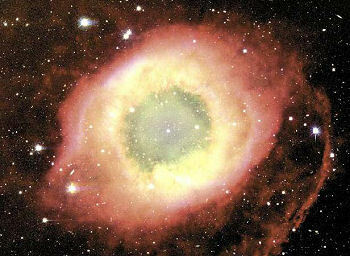 All of these images have had their stars edited out to show the emission only, and their field of view is 1180" × 1180". The upper three panels show 5.9''x 16.2'' samples around 378-801 from the WFPC2 programs GTO-5086 and GO-5311 selected to lie along the symmetry axis of the tail, which coincides with a radial line drawn towards the central star. The pixel scale has been adjusted to 0.05'' in order to agree with that of the STIS images. The diagonal feature across the [N II] cusp is an artifact in the original image. The upper left feature in the H(a) and [N II] images is probably a partially shadowed second knot that is unrelated to 378-801. The bands between the upper panels show the range of rows that were averaged when making the tail profiles shown in the lower three panels. 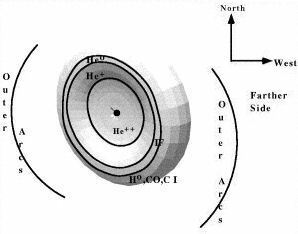 The limb brightening seen in H(a) contrasts with the concentrated emission seen in [N II] and the concentrated extinction seen in [O III]. 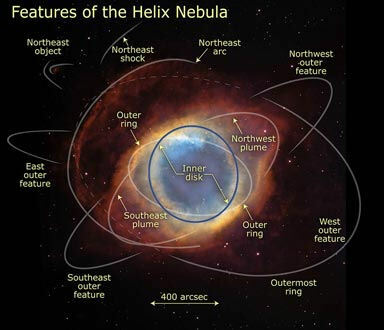 Next Edition -- Herbig-Haro Objects, HH1, HH2 & HH?? All images are the property of their indivual copyright holder or have been designated "in the public domain" when used as herein.